Marking the anniversary of ‘Quit India movement’, this was a call for superstitious and unscientific thinking to ‘Quit India’. 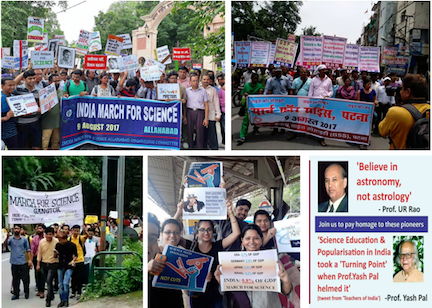 Organised by Breakthrough Science Society (a non-profit organisation based out of Kolkata with chapters in 14 states), ‘march for science’ across India, called for (1) increased budgetary support for research and science education, (2) a stand against obscurantism, and (3) engaging the public. Carrying banners like ‘Don’t bury your conscience under con science’, and ‘Always ask for evidence,’ thousands of science supporters marched in cities across the country on August 9. Marches in different cities witnessed wide involvement on social media, and were covered by leading dailies throughout. As much real was the excitement among march supporters and organisers, the march was not without its critics. Some expressed their disagreement on the march protesting budget cuts to science, citing 17% increase in DST’s budget and 12% increase to DBT in the latest budget. An argument could be made that Indian government, regardless of which political party is in power, has largely been supportive of science, or at the very least, not against it. But it is also true that lines between mythology and history are increasingly getting blurred, with leading public officials making statements for “good old days of Indian science”, claiming that everything from transplantation and aeroplanes were invented in India, and passed on to the rest of the world; all the while the national expenditure on science has consistently been less than 1% of GDP. In the interest of a balanced discussion, one has to wonder — matching national spending on science on par with other countries — will that be the answer to India’s science woes? What does it even take to increase GDP spending on science? And is the scientific community in the country prepared to absorb the hike to 3% proposed during the march? On the other hand, must we wait for more money to be made available for “achhe din” for science in India? “Even within the current funding, we can have a discussion about reprioritisation, about efficiency in the disbursal of funds, about involving younger scientists in the decision about how money is spent, etc. There is a lot we can ask for, not just more funds,” says Mukund Thattai from NCBS Bangalore. In part, the march in cities across India was meant “to complement and supplement global effort” we witnessed on Earth Day earlier in the year, with 600 marches across the world galvanised by anti-science stance of the new administration in the White House. The scene in India is not quite along the same lines as it is in US: while denial of climate change was emboldened in the US since the last presidential elections, India could pride itself on having a National Action Plan on Climate Change. But before we do that, consider some additional facts: India’s largest R&D organisation, the Council of Scientific and Industrial Research (CSIR), has recently declared ‘financial emergency’. Two years ago, CSIR was instructed to start financing itself. More recently, director-general Girish Sahni asked each CSIR lab to compile its own list of technologies that can be marketed/licensed to industry in order to raise funds. Interestingly, CSIR banned participation of its scientists in the August 9 march. For another [reason], more and more scientists are concerned over increased pseudoscience rhetoric around, a very recent example being an article in a leading daily that claimed eating during lunar eclipse is harmful (there is no evidence to support this claim). Very noticeably , all science academies in the country sat out the march. Why that was, who can say… But as IndiaBioscience reached out to people for comments, many either did not respond or did so only on the condition of anonymity. This concern for what might befall them, was common among people who marched and those who didn’t. “These worries are largely over-blown. There is no cause for this level of paranoia. It is one thing to not march because you disagree with some specifics of the goals of the march, but to not participate for the worry of being seen as ‘anti-national’ or ‘anti-government,’ there is no need for that”, remarks Thattai. Regardless of whether people joined in the marches or not, the overall cause of science does enjoy broad support in India, though this may have been the first time that the support was evident in the form of public marches. So, what’s next? A loud and clear message since is that the marches ought to be the first of a continuum of steps for the scientific community to engage the public. Organisers from science march Allahabad are developing plans for broad engagement with the public, addressing among other things, widely held superstitious beliefs; a sentiment echoed also by organisers at Wardha (Maharashtra).